Medieval, cobblestone streets, and magnificent abbeys and century-old chateaus abound the “Most Beautiful Villages of France” in Burgundy. So much to discover, and so little time. Chateauneuf-en-Auxois is a pretty hilltop village watching over flat open country and the Burgundy Canal. Châteauneuf is best known for its 12C Chateau, which once played an important defensive role for the road leading to Autun. The medieval streets reveal many fine merchant houses from the 14th -16 centuries, built in yellow-white stone and having several interesting facades to discover as you take a stroll around. 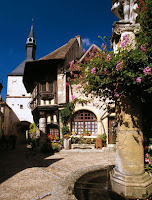 Perched high on a rock, Flavigny-sur-Ozerain brings the old world Burgundian charm to life. Known for its religious buildings - above all the church of St. Genest and the Benedictine abbey of Saint Pierre - , the tiny town is also interestingly a city of craftsmen and traders. Venture along cobblestone streets into its alleys; the source of its hidden charm with turreted houses and other medieval architectural details. Enter the well-preserved medieval city of Noyers, curled up on the banks of the River Serein. Inside the town walls, there are half-timbered, 15th century stone houses, pretty squares and arches leading to narrow cobbled streets. Additionally, take one step onto Place du Marché-au-Blé or Place du Grenier-à-Sel (Wine, Corn Market and Salt Storehouse Squares), and you’ll catch a glimpse of the town’s thriving period of farming and trade. Heritage enthusiasts will relish Semur-en-Brionnais, the formal capital of the Brionnais region where Hugues de Semur was born, founder of Cluny Abbey. The fascinating 9th-century Château St Hugues is the oldest castle in Burgundy. Take a walk to romanesque Church of Saint Hilaire with its tower displaying eight arches and columns, and the Maison du Chapitre famous for its painted chimney breast. 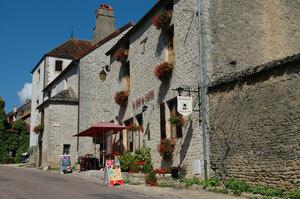 The charming village of Vezelay sits high on a hilltop overlooking onto the Monts du Morvan. Home to beautiful stone Romanesque houses that are mostly cafes, galleries and gift shops and the magnificent St. Madeleine Basilica - a brilliant work of Romanesque art and architecture that contains relics of Mary Magdalene herself – the village personifies typical Burgundian character. Vézelay and the abbey are listed by UNESCO as a World Heritage Site. Venture to Burgundy's beautiful villages along a Hotel Barge Cruise!